A sixth consecutive net monthly gain? 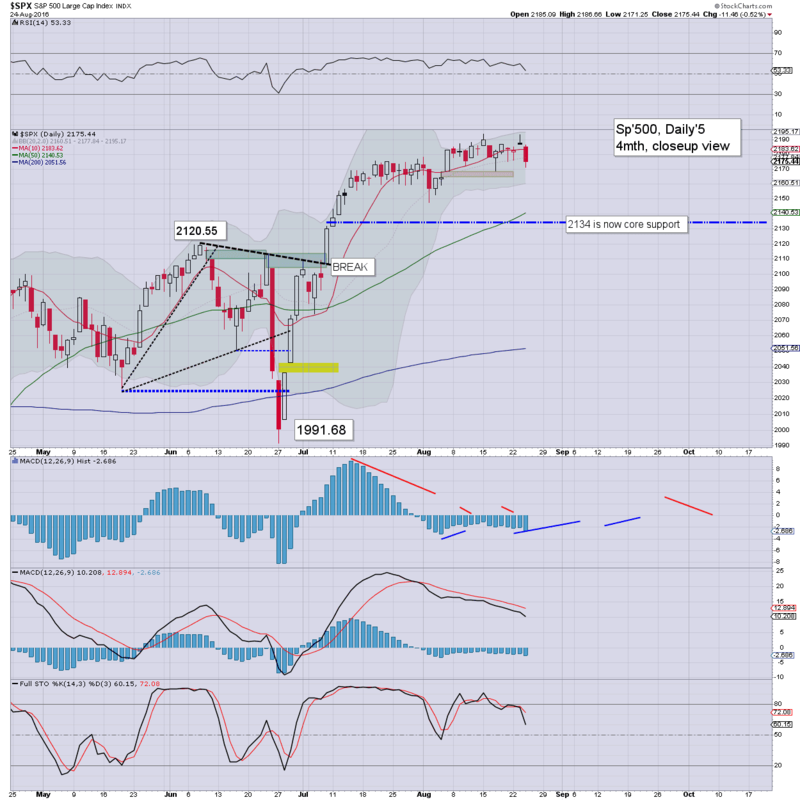 US equity indexes closed moderately mixed, sp -4pts at 2176 (intra low 2170). The two leaders - Trans/R2K, settled higher by 0.1% and 0.6% respectively. 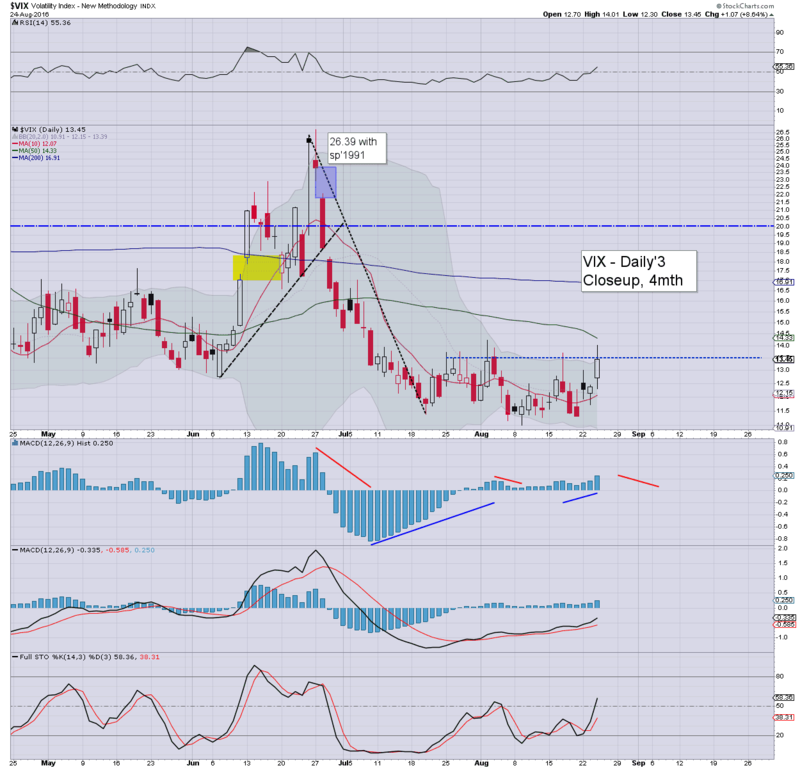 VIX settled +1.4% @ 13.12. 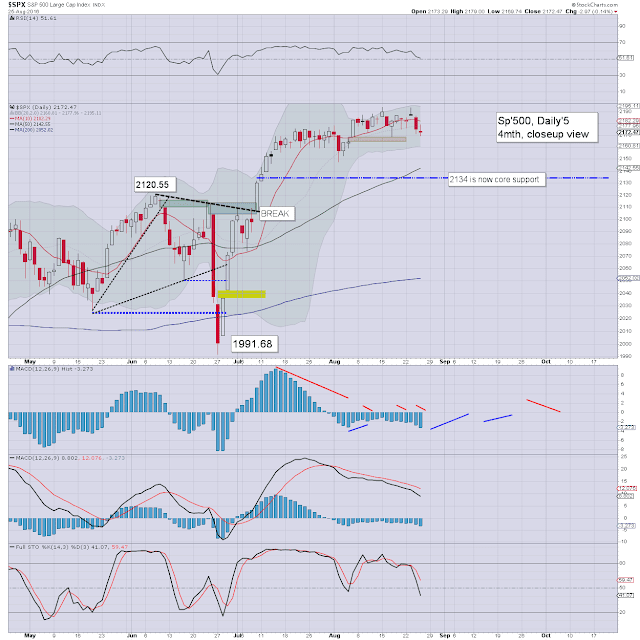 Near term outlook is bullish into and beyond the Labor day holiday break (Sept 5th), with sp'2225/50 a viable target by late September. A pretty subdued day.. as expected... leaning a little weak. 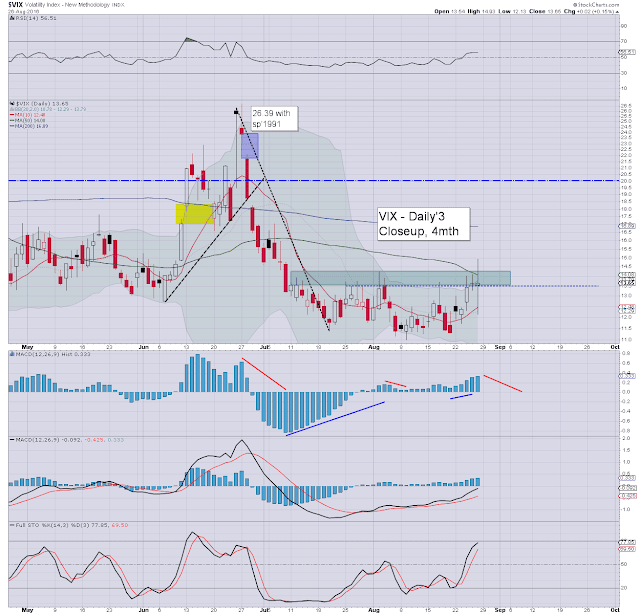 Even the afternoon cooling to sp'2170 only saw the VIX climb to 13.60. A move to the 15s looks highly unlikely in the near term, with the key 20 threshold out of range until late September. 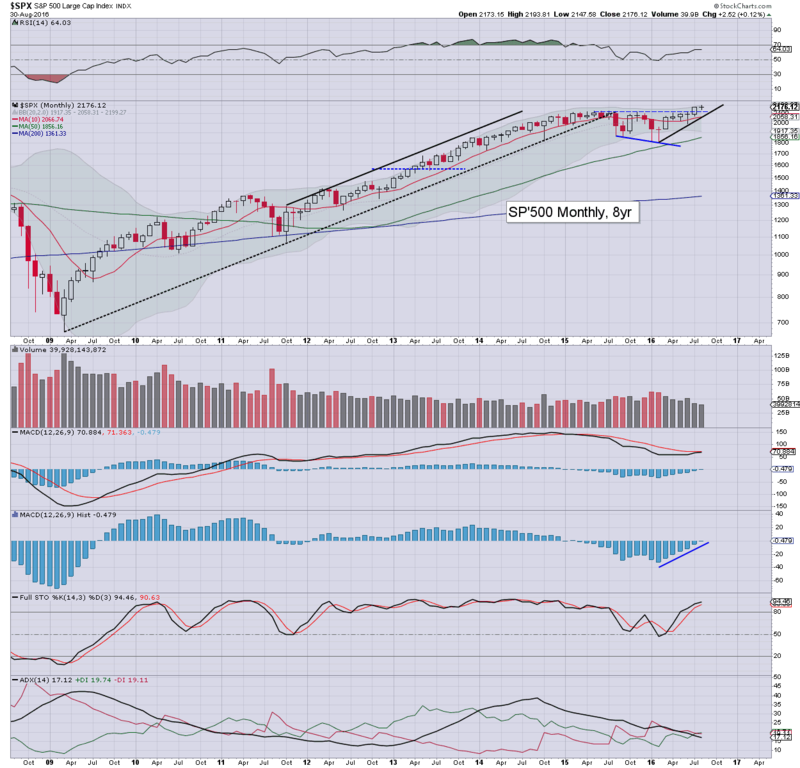 Considering the short term cyclical setup, the sp' is set for a sixth consecutive net monthly gain - the best run since summer 2013. I am well aware - and would agree, that the Sept/Oct' period can be a struggle for equities, but broadly, I don't see a move back under the breakout level of sp'2134. Bears... look..... toast. It was a choppy and mixed week for US equity indexes, with net weekly changes ranging from +0.1% (R2K), -0.7% (sp'500, NYSE comp'), to -1.3% (Trans). 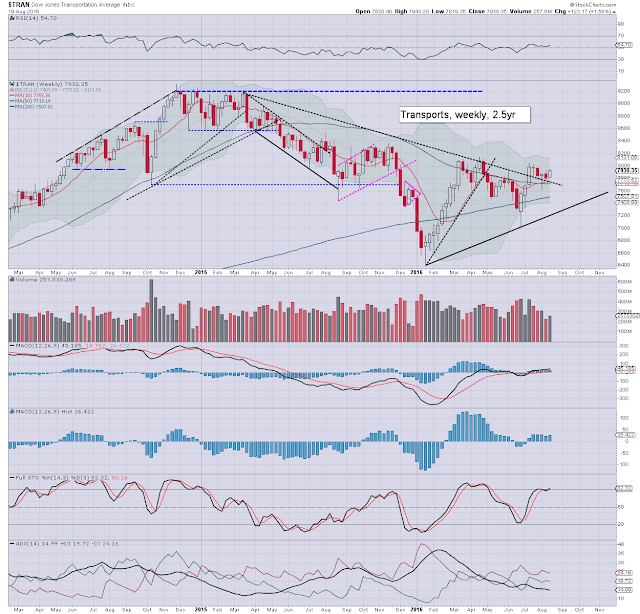 Near term outlook is for further broad upside of at least another 2-3%. The bulls are likely safe until at least the opex of Sept'16th. With a three day run of daily declines, the sp' saw a net weekly decline of -14pts (0.7%), settling at 2169. 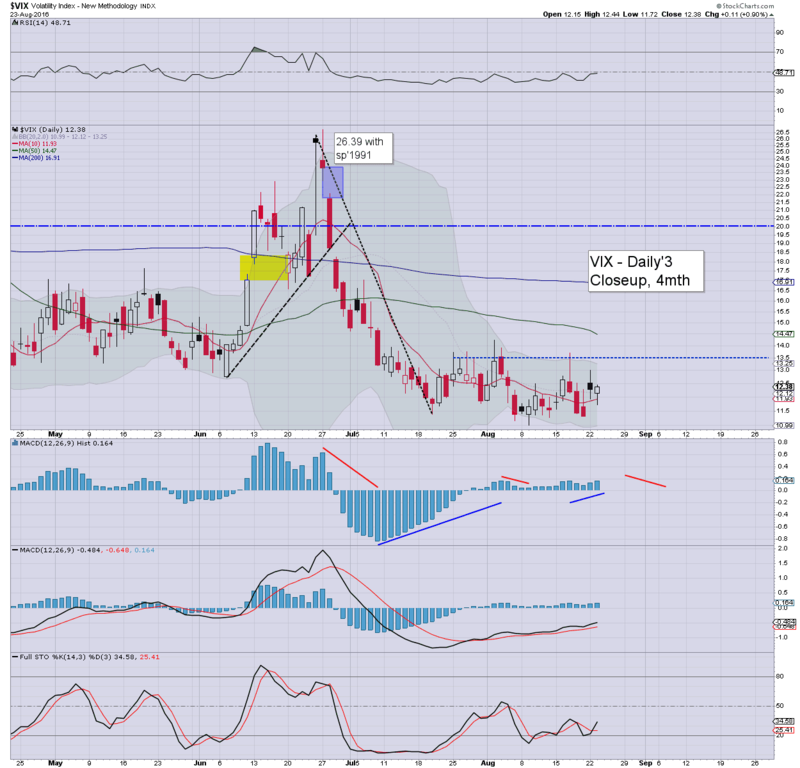 Its notable that the market did challenge the recent historic high of 2193, and saw a clear rejection. Underlying MACD (blue bar histogram) cycle ticked lower for a third consecutive week, although is still another 2-3 weeks from turning negative cycle. Rising trend - linking the Feb' and June lows, will be in the 2130s by mid October. Unless equity bears can break under 2134, the 2100 threshold, and see a close under the monthly 10MA (2060/70s in Sept/Oct)... there still isn't any reason to get overly concerned about some kind of autumnal crash. After eight weeks of consecutive gains, the tech' finally saw a decline... but just -0.4%, settling @ 5218. 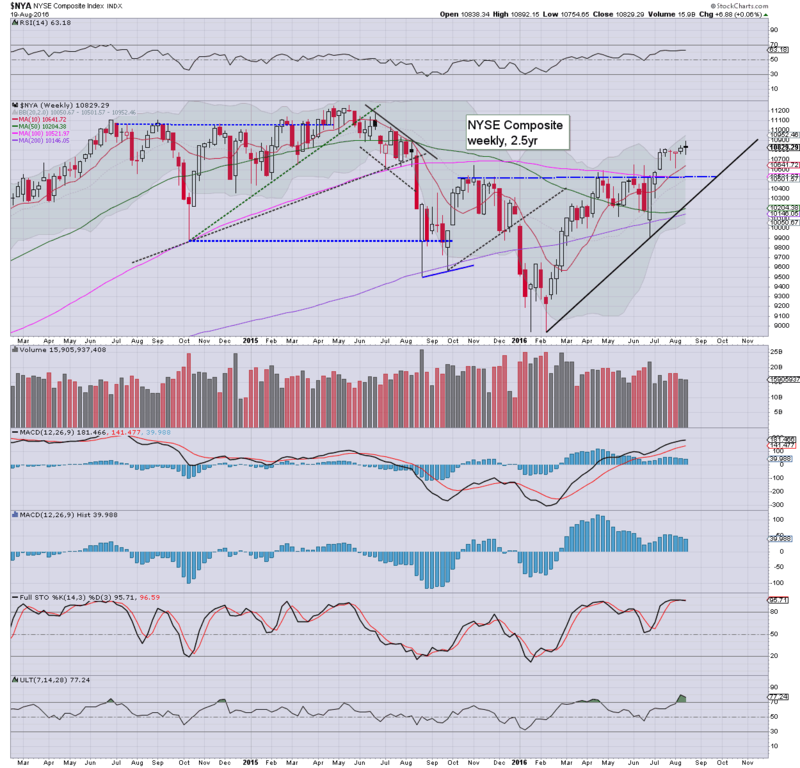 However, its notable the Nasdaq did attain a new historic high of 5275. First big support is the 5000/4950 zone. 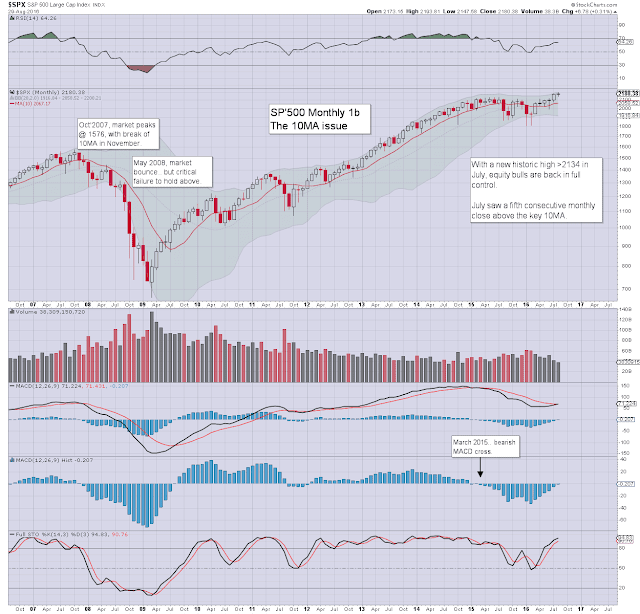 As things are, a monthly close - whether Aug/Sept', in the 5300s still looks probable, and that should be enough to awaken the mainstream to the notion that the 6000s will be a valid target by late spring 2017. The mighty Dow settled -0.8% @ 18395. 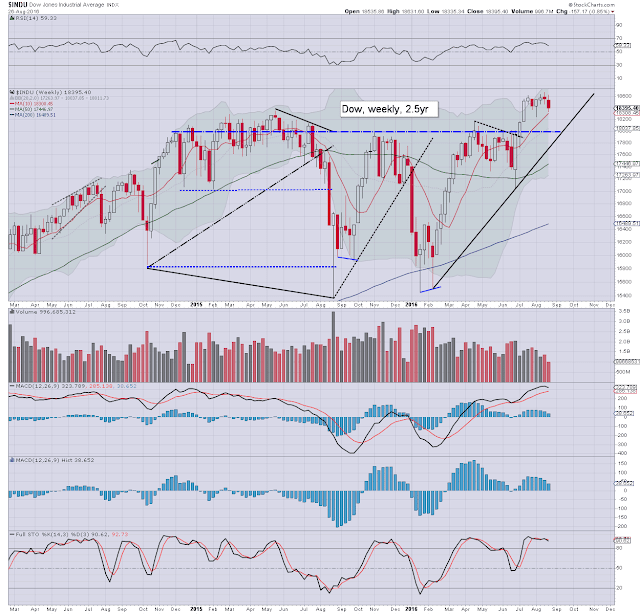 The 18k threshold remains powerful support, and frankly, that should hold in the months ahead. 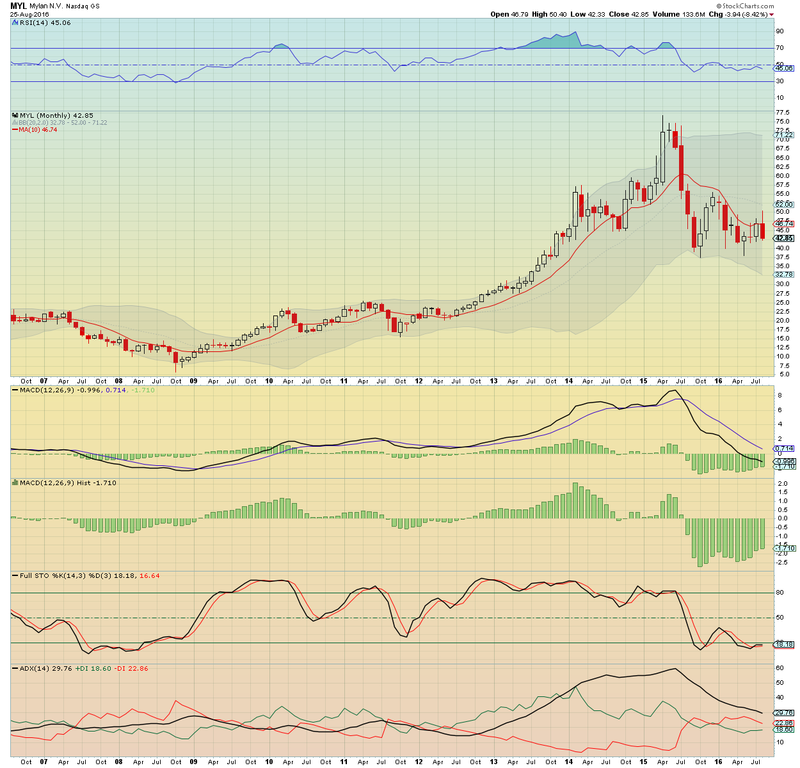 The upper weekly bollinger is in the 18800s, price action >19k looks viable in the latter half of September. 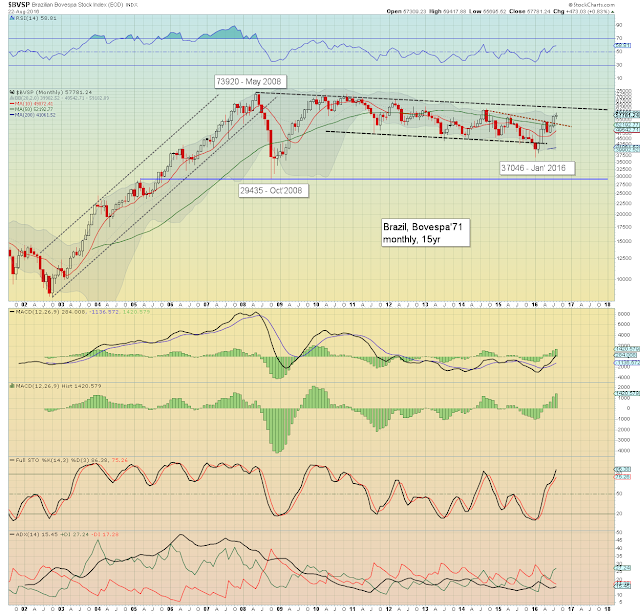 The master index settled -0.7% @ 10749. The 11k threshold remains next upside target. Things only get bearish on a break <10500. 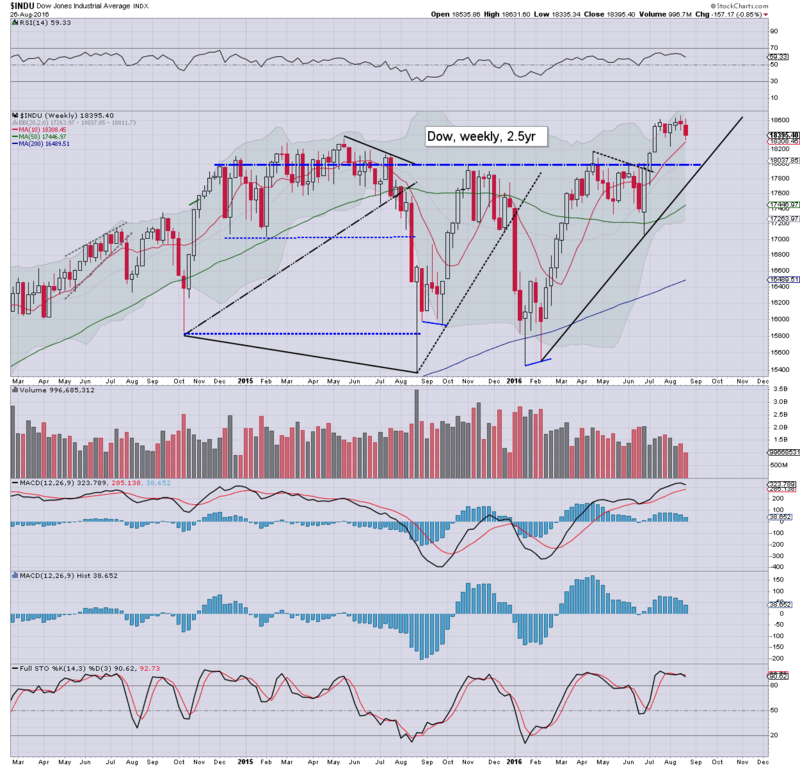 The second market leader - R2K, was the anomaly this week, with a fractional gain of 0.1%, settling @ 1238. 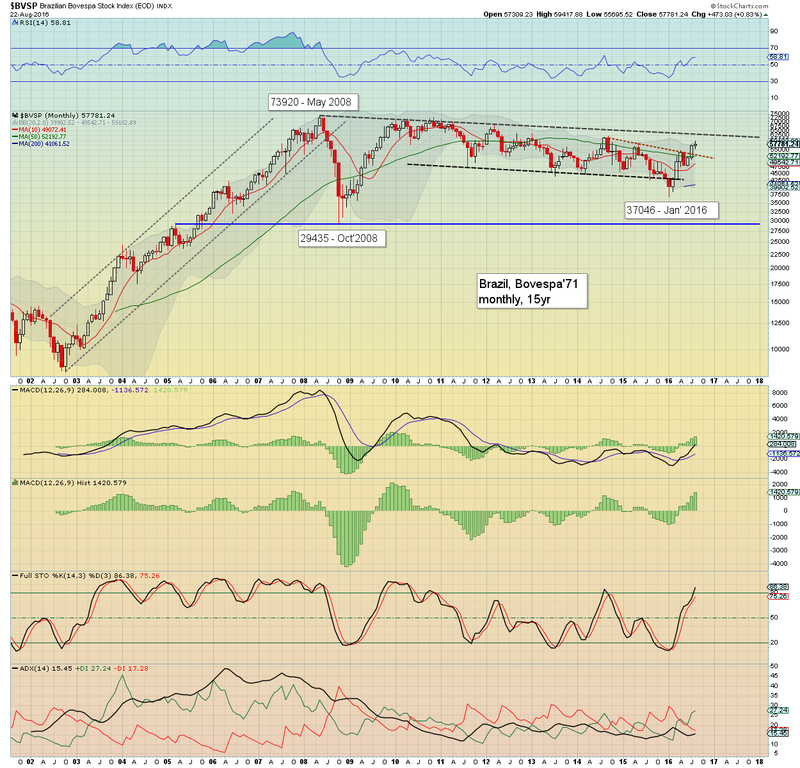 Its notable that the R2K hit a new multi-year high of 1251, which is just 45pts shy of the 2015 historic high. 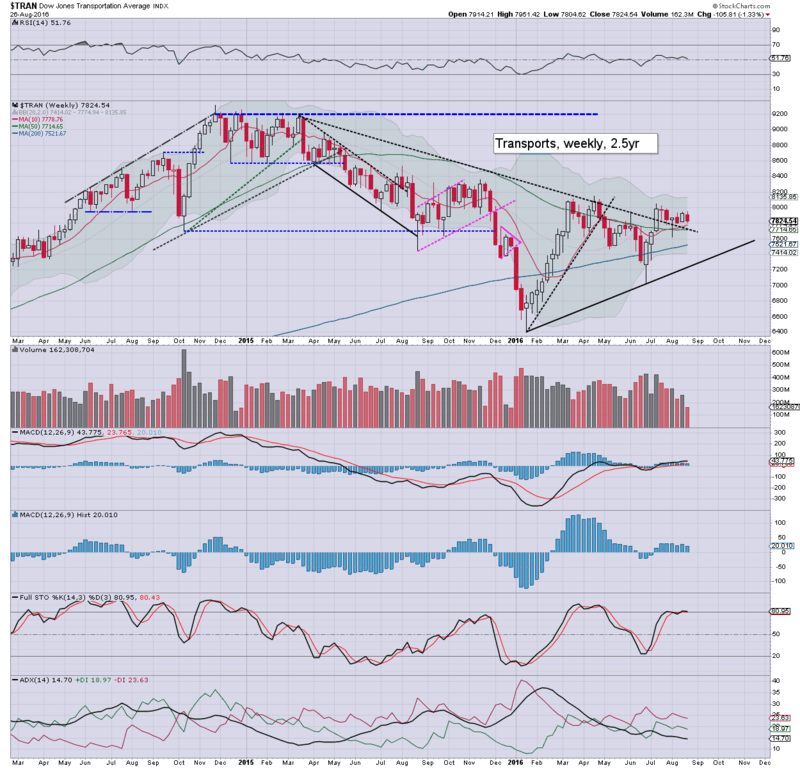 The 'old leader' - Transports, remains the market laggard, settling -1.3% @ 7824. The 8k threshold is strong resistance. 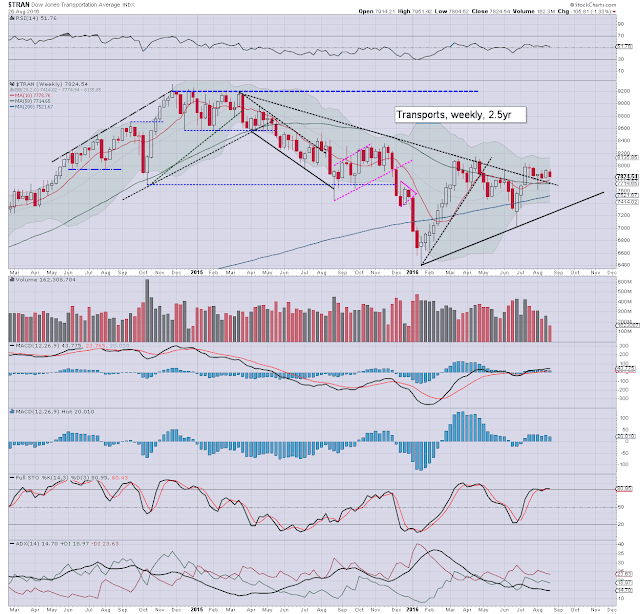 Things only get bearish if <7600. 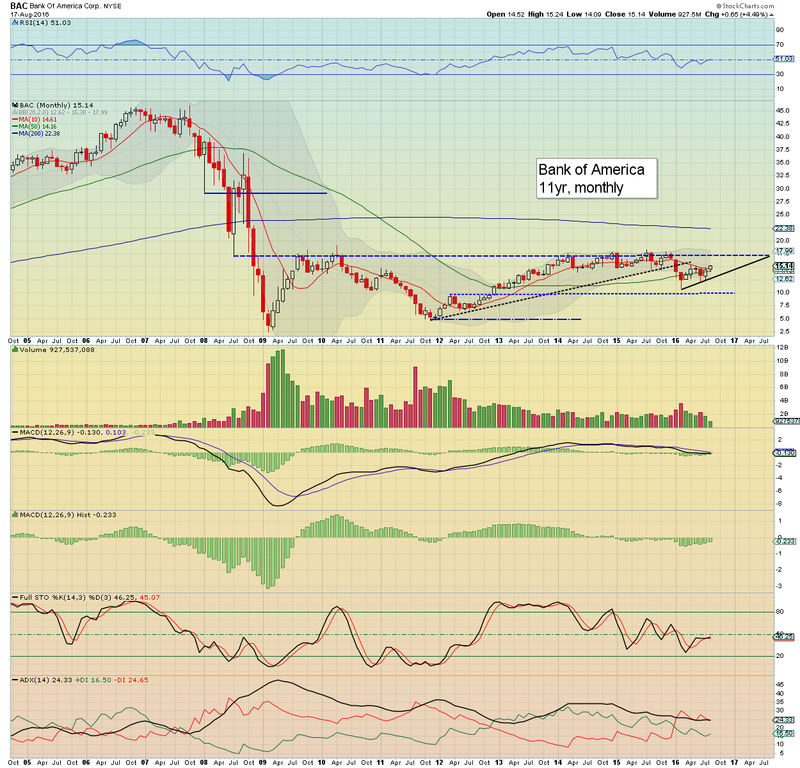 Alarm bells should sound this autumn if <7k, but that does look unlikely. A mixed week for US equities. 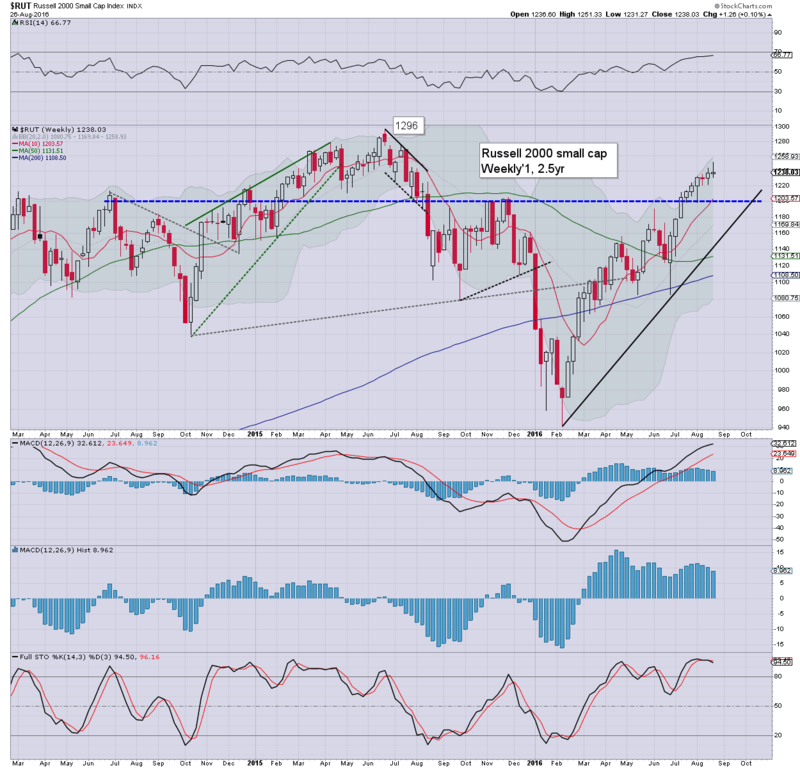 Despite the chop/weakness, the Nasdaq still managed a new historic high, with the R2K continuing to close in on breaking the June 2015 high of 1296. 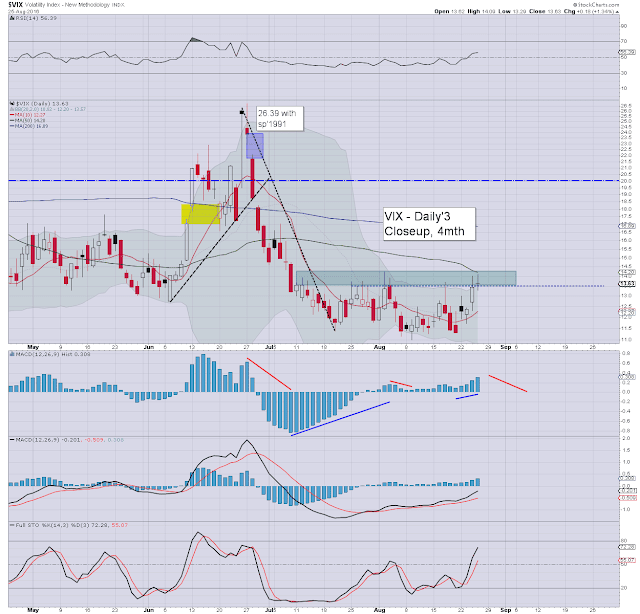 Equity bulls have a basic safety-buffer zone of around 2% - such as the breakout level of sp'2134. 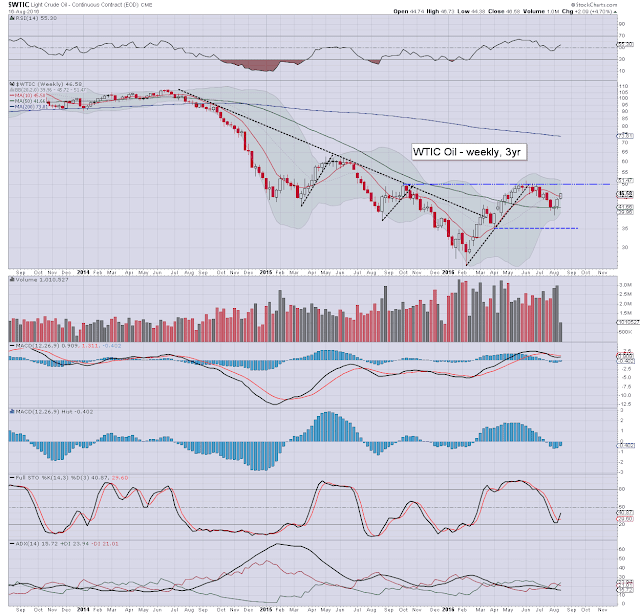 Things only turn provisionally bearish if core rising trend is broken, and more so, the June lows - such as sp'1991. *there are a number of fed officials speaking Wed-Friday. **Friday will see normal trading hours, however its important to keep in mind the following Monday (Sept'5th) is closed for the 'Labor day' holiday. So... price action is likely to become quickly subdued once the jobs/econ-data has been released. If you have valued my posts since February 2012, please support me via a monthly subscription, which will give you access to my continuing intraday posts at my main home of permabeardoomster.com. If you think I'm worth at least something around $1 per trading day, then sign up! As ever, your comments - whether bullish or bearish, are welcome. US equity indexes closed moderately weak, sp -3pts, @ 2169 (intra range 2187/60). The two leaders - Trans/R2K, settled lower by -0.5% and -0.2% respectively. VIX settled +0.1% @ 13.65. 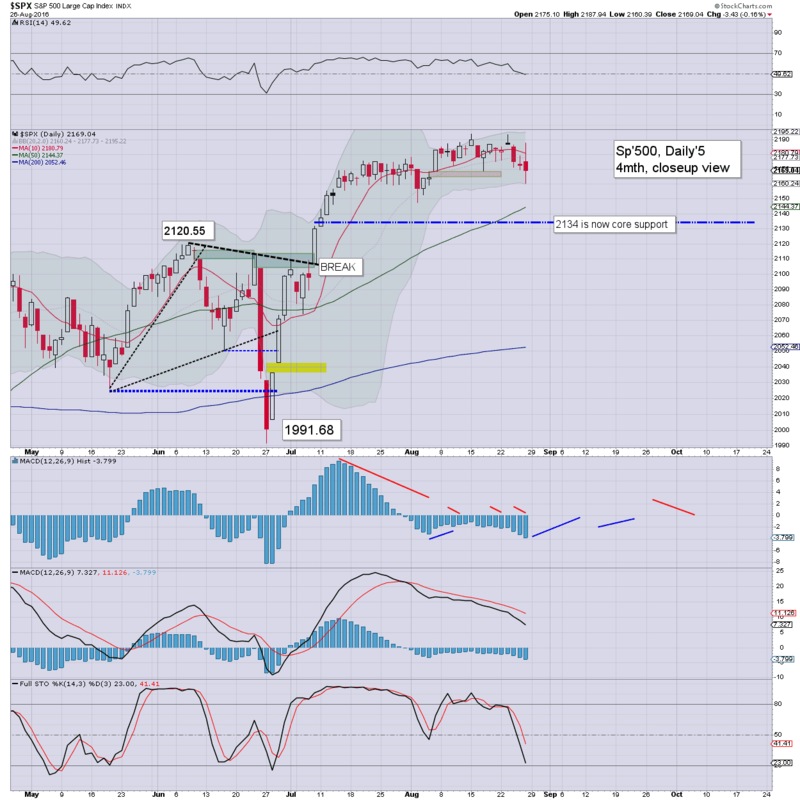 Near term outlook is for renewed upside past the Labor day holiday (Sept'5th) into the sp'2200s. Yellen placated the market in early morning with the usual fedspeak, and after a little chop the market had climbed to sp'2187. Yet.. Fed official Fischer's appearance on clown finance TV gave the market the excuse for a significant swing lower. 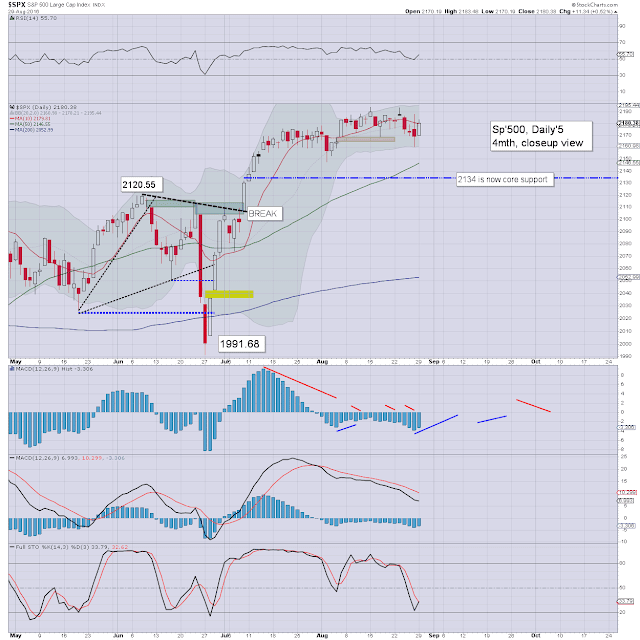 The sp' tested the lower daily bollinger @ 2160, with a closing hour moderate recovery. Despite the 27pt downward swing, the VIX only managed a high of 14.93, and with the closing hour recovery, it cooled back to the mid 13s. Broadly the key 20 threshold still looks at least another month away. 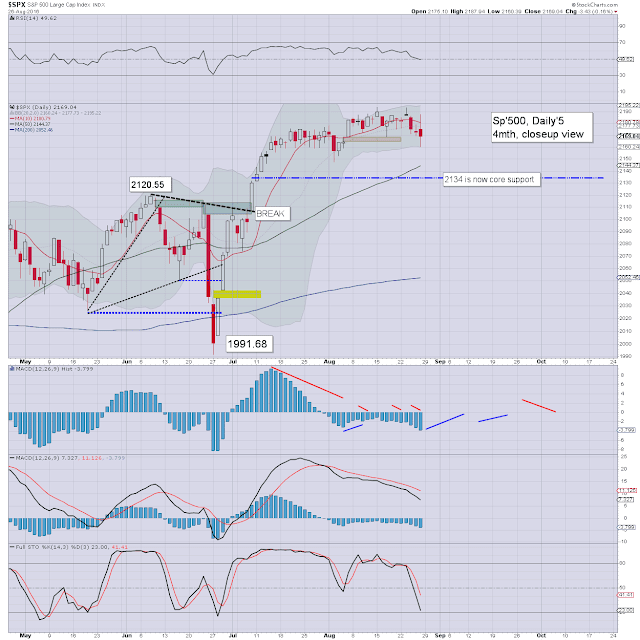 US equity indexes closed moderately weak, sp -11pts @ 2175. The two leaders - Trans/R2K, settled lower by -0.1% and -0.9% respectively. VIX settled +8.6% @ 13.45 (intra high 14.01). Near term outlook offers Thursday chop.. ahead of Yellen on Friday. 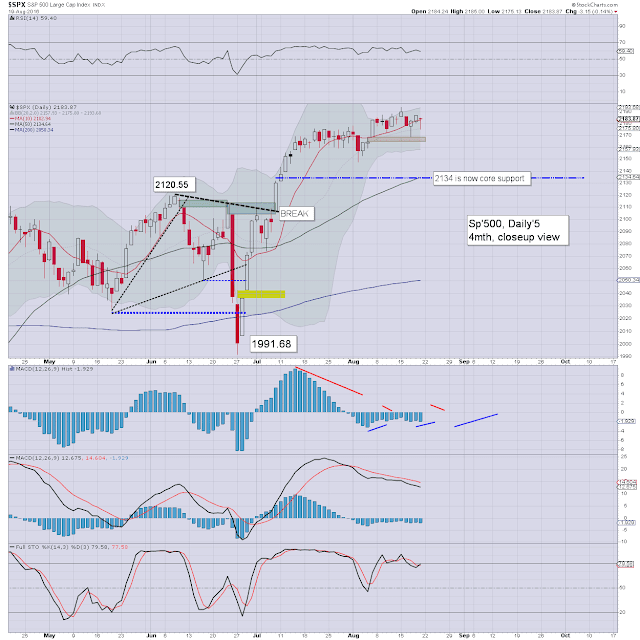 From there, the 2200s remain probable before end month. It was just another day of minor price chop... leaning on the moderately weak side. VIX finally managed a close in the 13s, for the first time in 3 weeks. 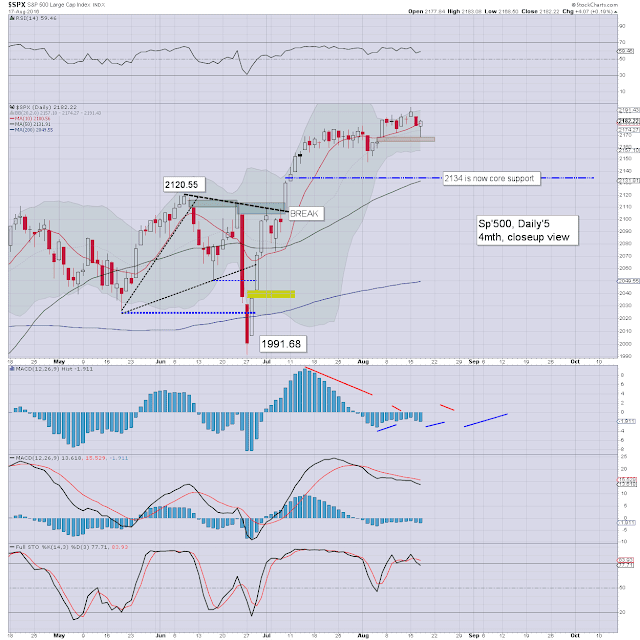 However, the key 20 threshold still looks out of range for at least another month. As I noted yesterday, mainstream talk is increasingly looking ahead to year end. 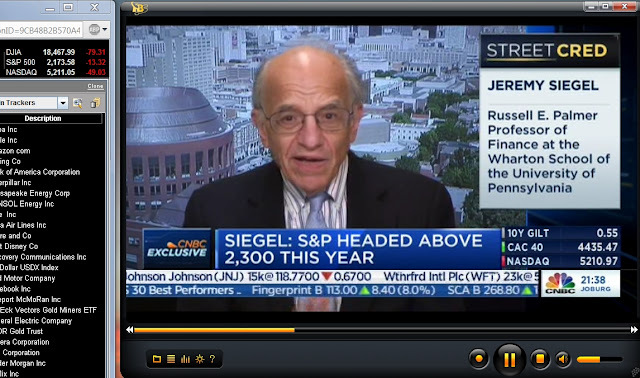 Siegel is another who is seeking the sp'2300s by year end. 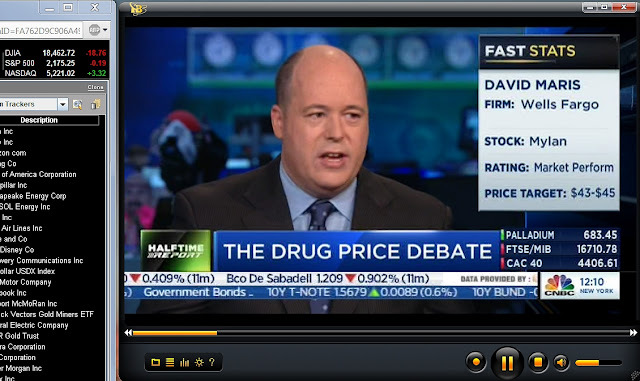 Its obvious.. but still worthy of note... we're only talking about upside of 6-7%... which isn't exactly bold, considering we've four full months remaining of the year. For me, unless we trade back under the breakout level of the 2130s in the somewhat tricky period of Sept/Oct, there is zero reason to expect any kind of autumnal/end year crash. 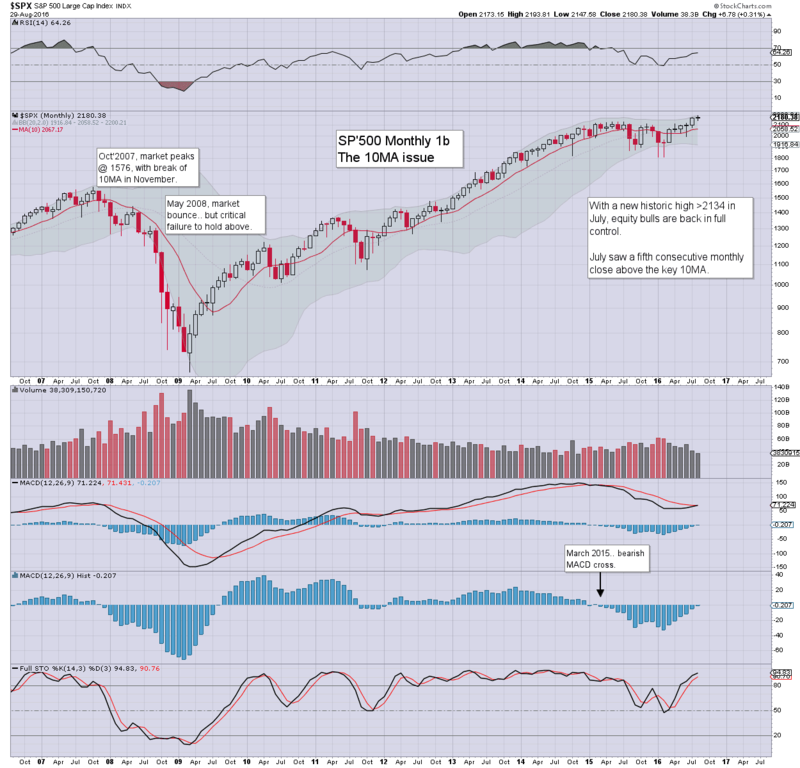 I'll only put on my bearish hat if we're trading under the monthly 10MA, which in October will be around 2100. US equity indexes closed moderately higher, sp +4pts @ 2186 (intra high 2193). The two leaders - Trans/R2K, settled higher by 0.4% and 0.7% respectively. 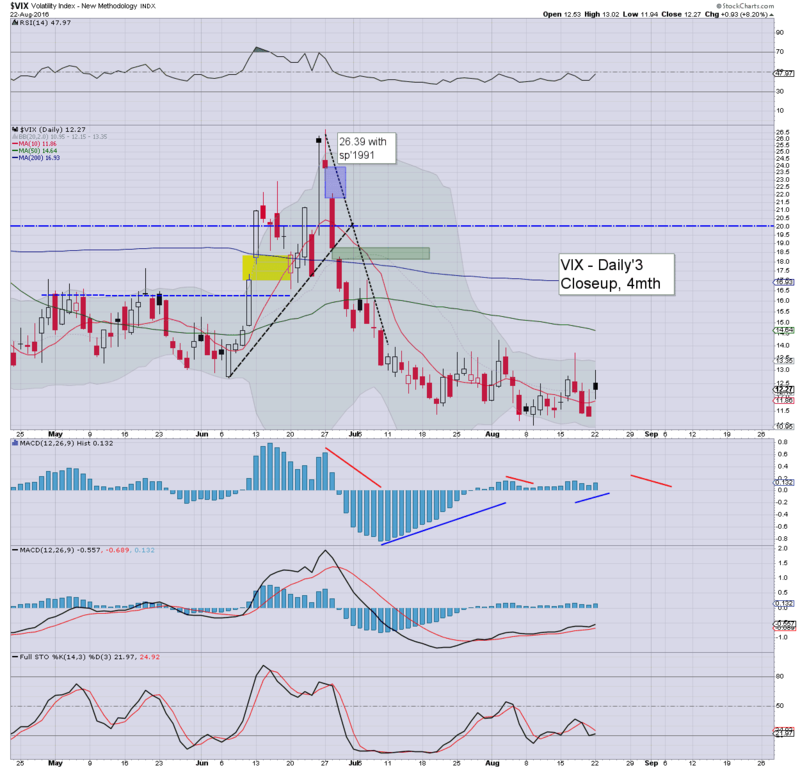 VIX settled +0.9% @ 12.38. Near term outlook is for a lot of chop ahead of Yellen, due this Friday morning at Jackson Hole. 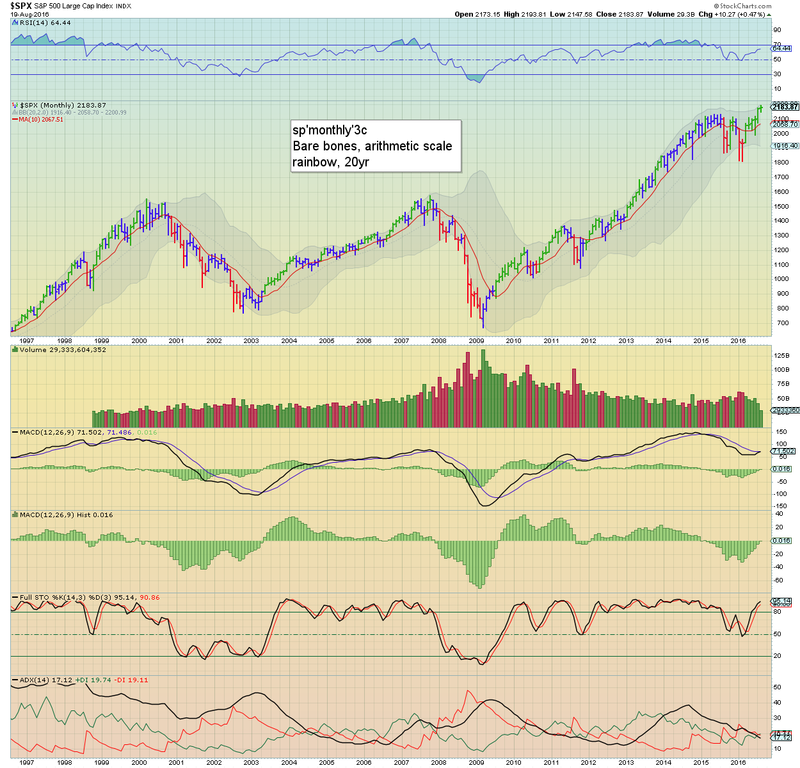 *a notable new historic high of 5275 for the Nasdaq comp'. 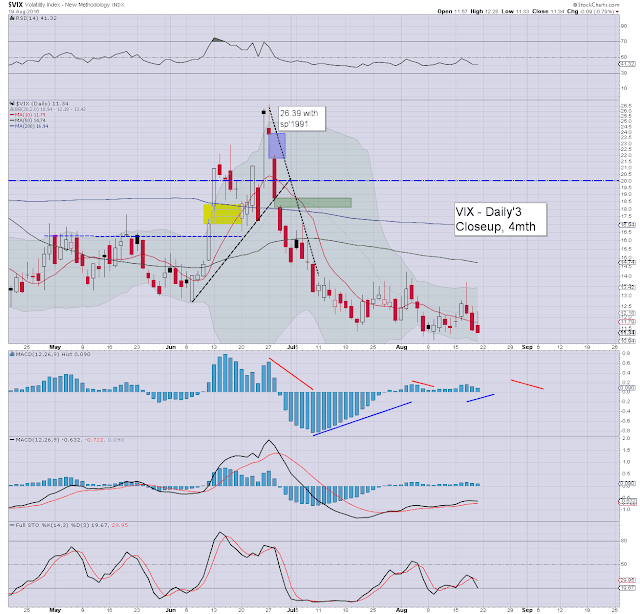 It remains the case that any monthly close in the 5300s should be enough to awaken the mainstream to begin chatter about when the 6000s will be seen. As for today... the market was certainly a little stronger than expected, with the sp/dow coming very close to breaking new highs. Clearly though, as Yellen is due this Friday morning, many traders are naturally unwilling to get involved. VIX remains very subdued, still entirely unable to break and hold the low teens. The key 20 threshold looks out of range for at least another month. 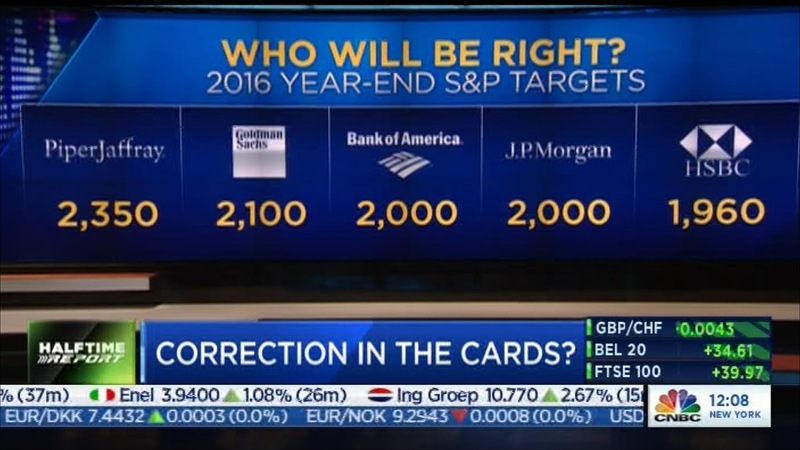 During today's lunch time show, the cheerleaders on clown finance TV were again day-dreaming about where the market will settle the year. 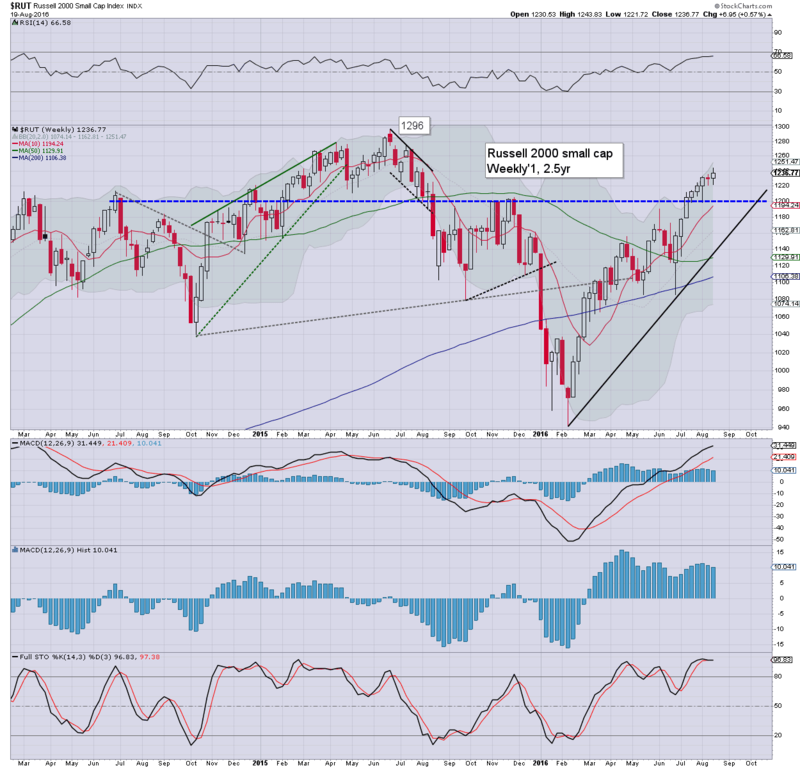 There are increasingly a broad range of targets, with some expecting sustained weakness/volatility - largely due to the US election, with downside to around sp'2000. 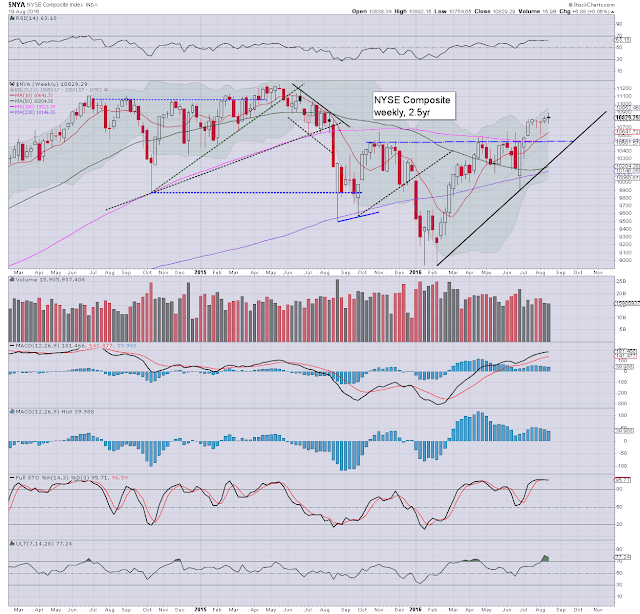 A few of the more bullish are seeking broader upside to the 2300s. My guess? If we don't break <2130 during Sept/Oct, then another powerful blast higher will occur, with a year end close somewhere around 2300. If that is the case, then the 2400s in spring 2017 will be an easy target. It was a mixed week for US equity indexes, with net weekly changes ranging from +1.6% (Transports), +0.6% (R2K), u/c (sp'500), to -0.1% (Dow). 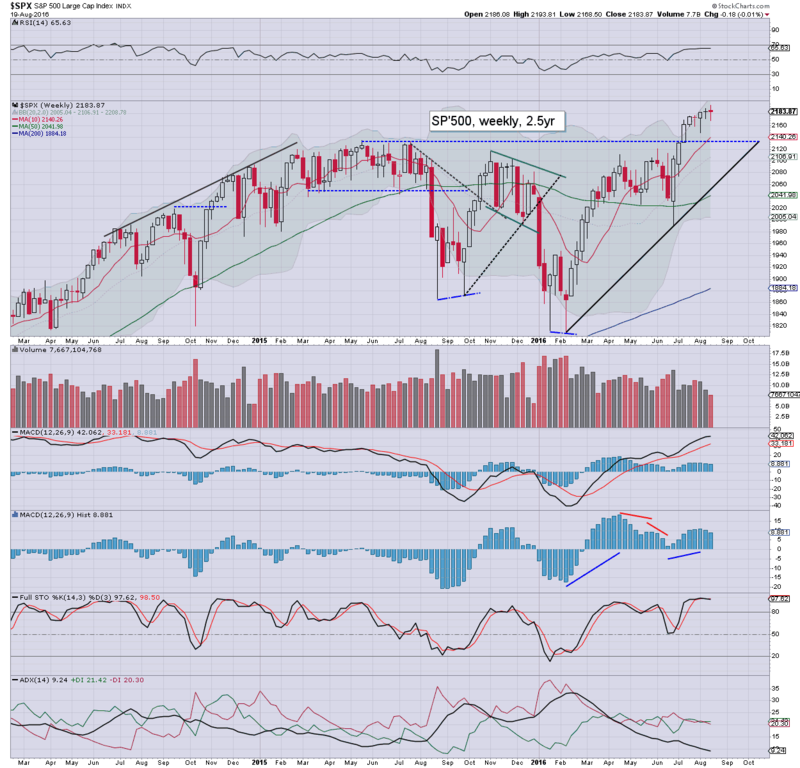 Near term outlook offers further chop, but eventual upside into the sp'2200s. More broadly, its a case of whether the market can battle through Sept/Oct' without falling back under the breakout levels. Effectively, a flat close on the week, settling at 2183. However, there was a notable new historic high of 2193, a mere 0.3% shy of the 2200s. 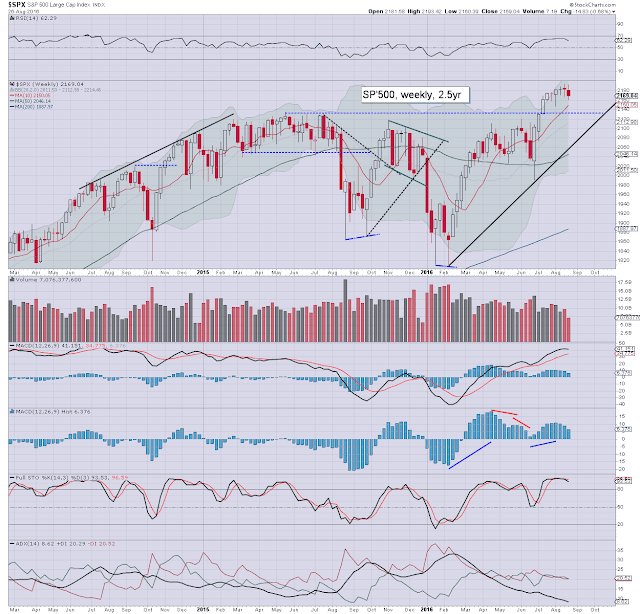 Underlying MACD (blue bar histogram) ticked lower for a second week. The breakout level of 2134 is now going to act as powerful support, and we also have the key 10MA lurking around the 2140s. 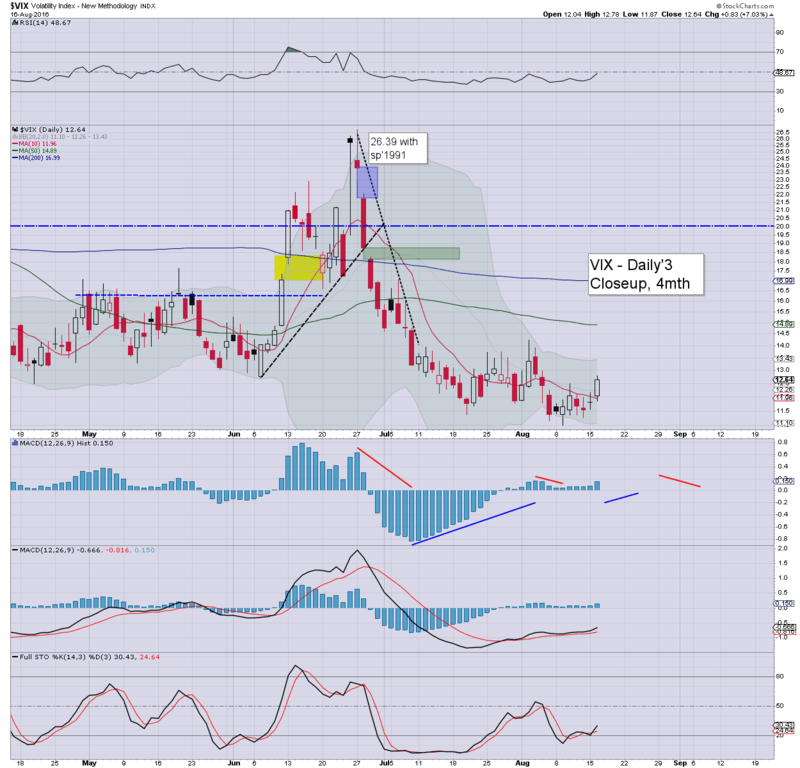 Best guess: upside to the 2225/50 zone by mid/late September. Any multi-week down cycle from late Sept-mid Oct' will likely be choppy, and not break <2134. A year end close in the 2275/2325 zone looks very feasible. Equity bears have nothing to tout unless a break <2134, and more so... rising trend, which in early October will be around 2120. An eighth consecutive net weekly gain for the tech - the best run since spring 2010, having broken a new historic high of 5271. Core support is the 5000/4950 zone. The upper weekly bollinger will soon be offering the 5300s. 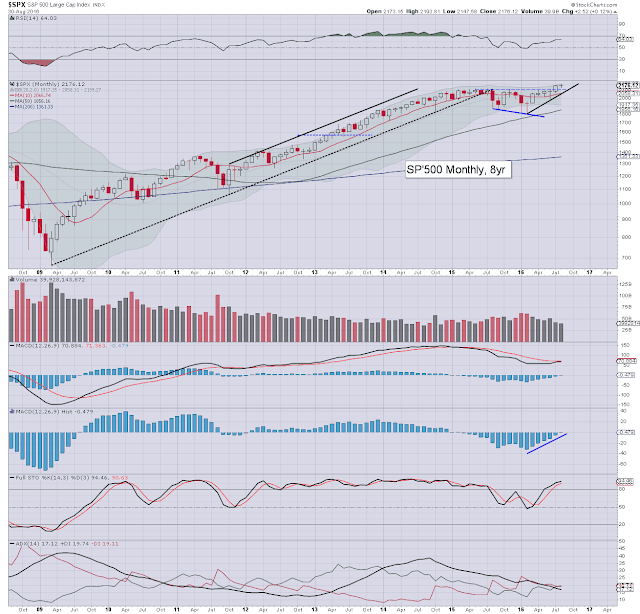 Any monthly close - whether Aug/Sept/Oct in the 5300s will provisionally open the door to the 6000s by late spring 2017. 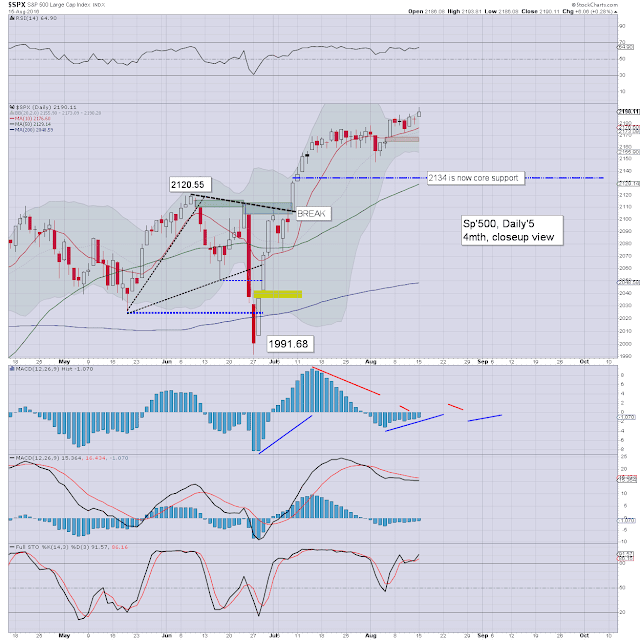 Things only turn decisively bearish on any close <4900, and frankly, that looks extremely unlikely any time soon. The mighty Dow was the weakest index this week, settling net lower by -29pts (0.1%) to 18552. 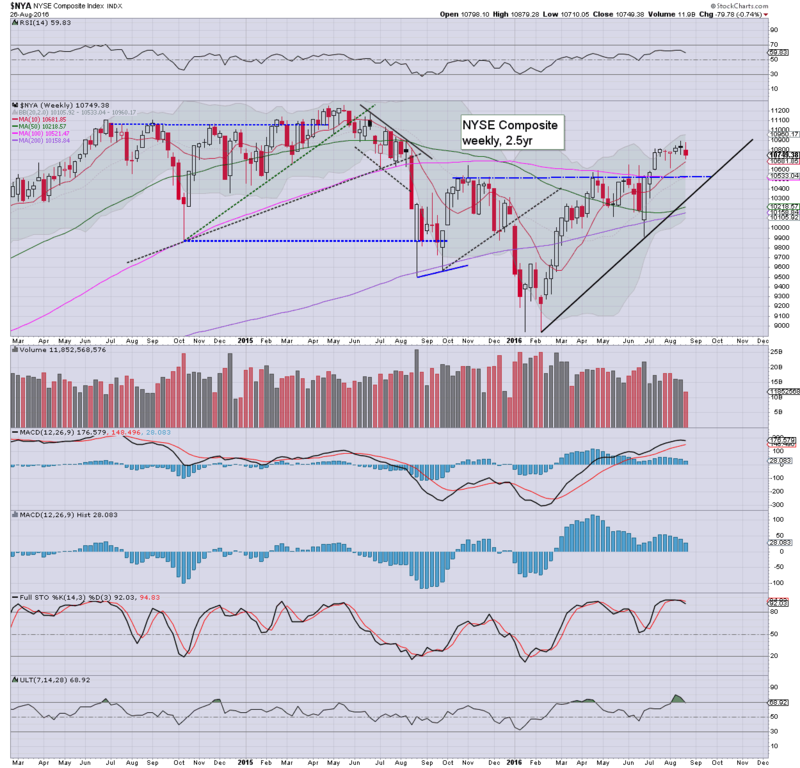 However, like the sp' and Nasdaq, the Dow also broke a new historic high of 18668. The 18k threshold is core support. 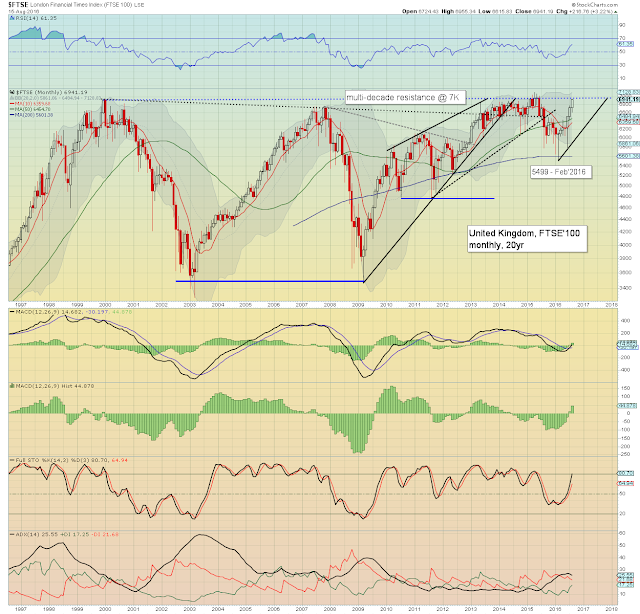 By early Oct' rising support will be around 18200. 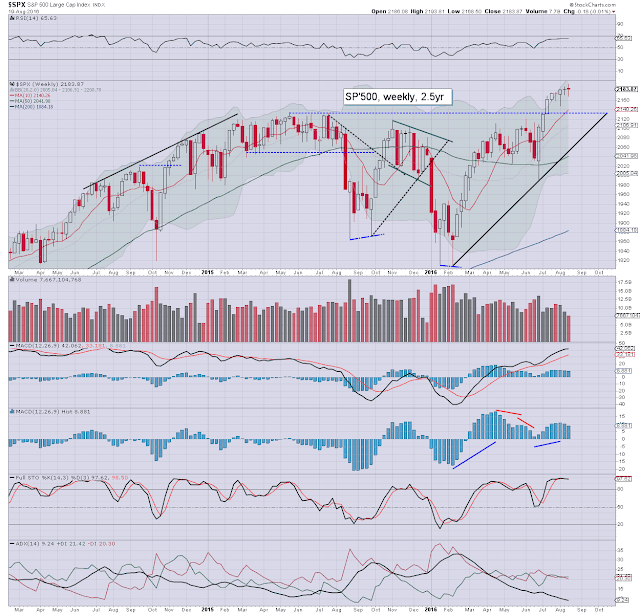 Any price action >19k should clarify further upside to the giant psy' level of 20k. 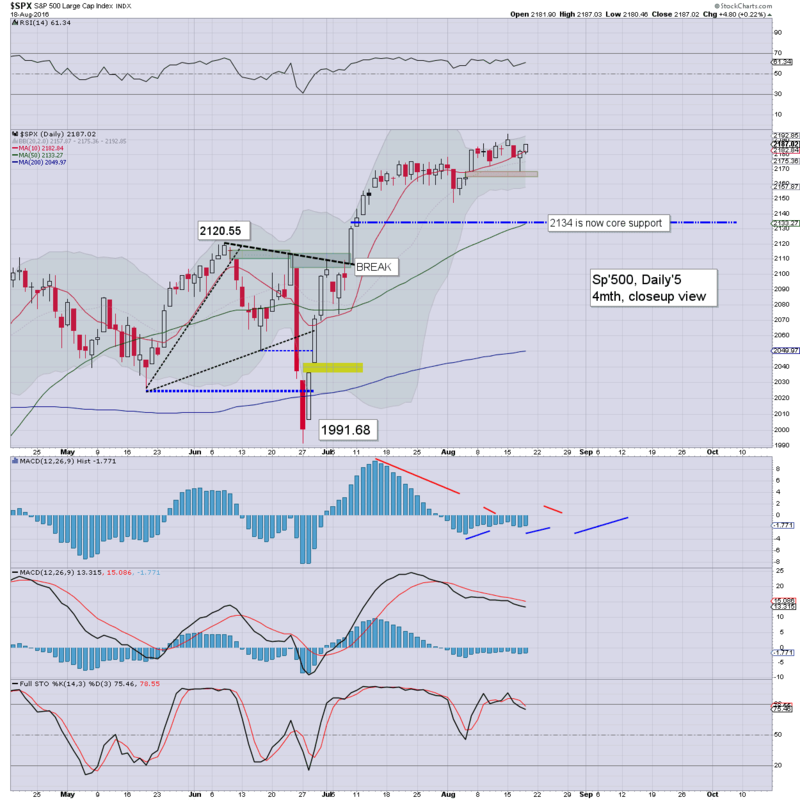 The master index reflected the broader market, settling +0.1% @ 10829. 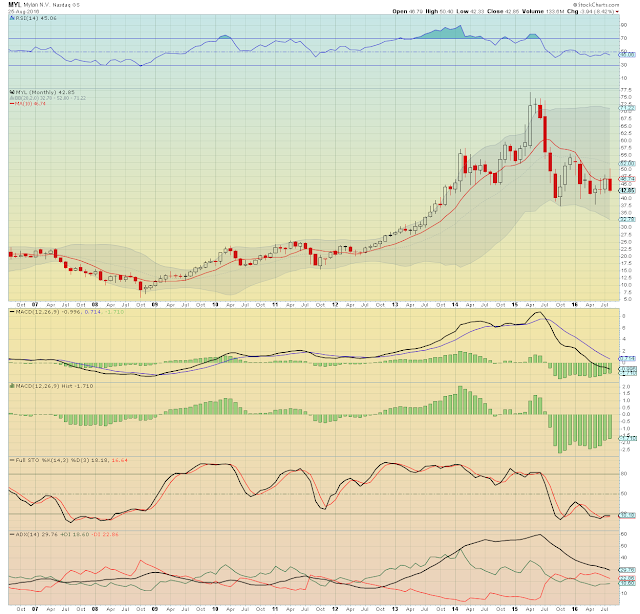 The upper weekly bollinger will be offering 11k by early September. A break above the May 2015 high of 11254 looks within range for Oct/Nov. Core support is the 10500/000 zone. The second market leader - R2K, saw a moderate net weekly gain of 0.6%, settling at 1236 - 60pts (5%) below the June 2015 high. A new historic high looks out of range until October. 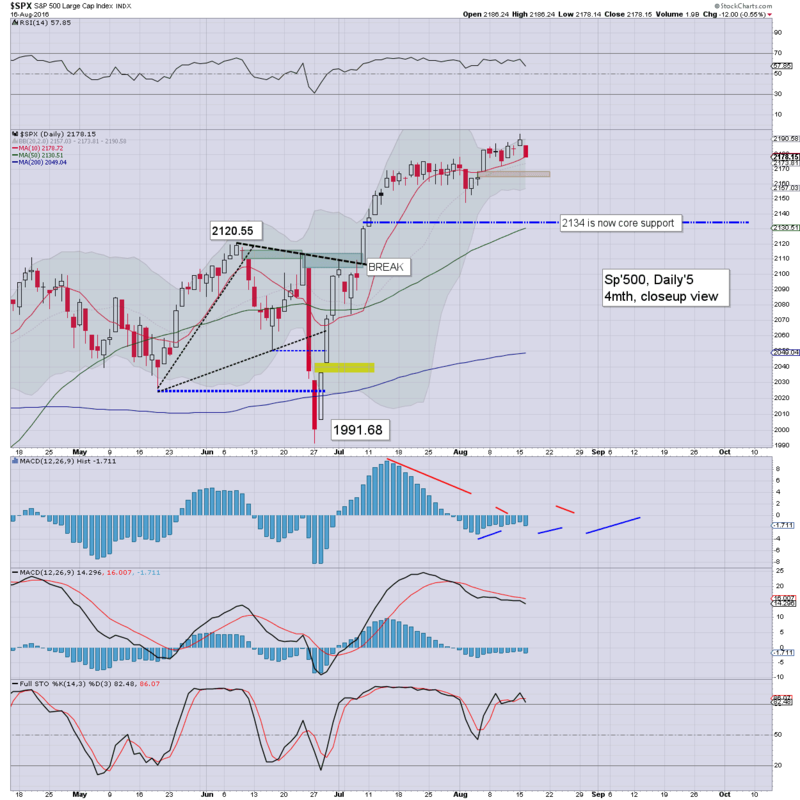 A year end close in the mid 1300s looks probable. The 'old leader' - Trans, saw a sig' net weekly gain of 1.6%, settling at 7930. 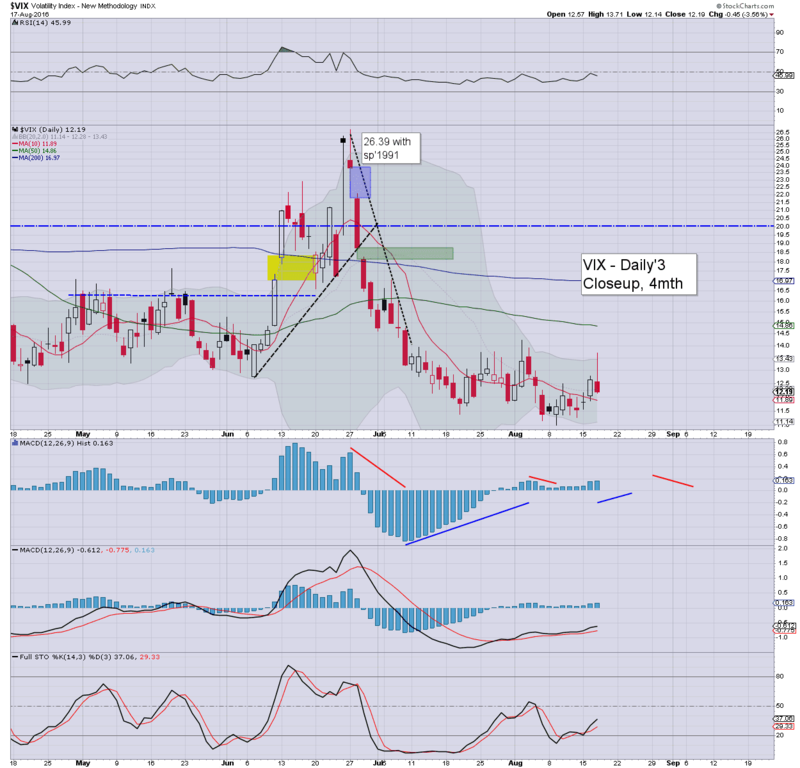 8k remains strong resistance, but looks set to be broken.. and held above... by early September. From there, the 8300/400s. 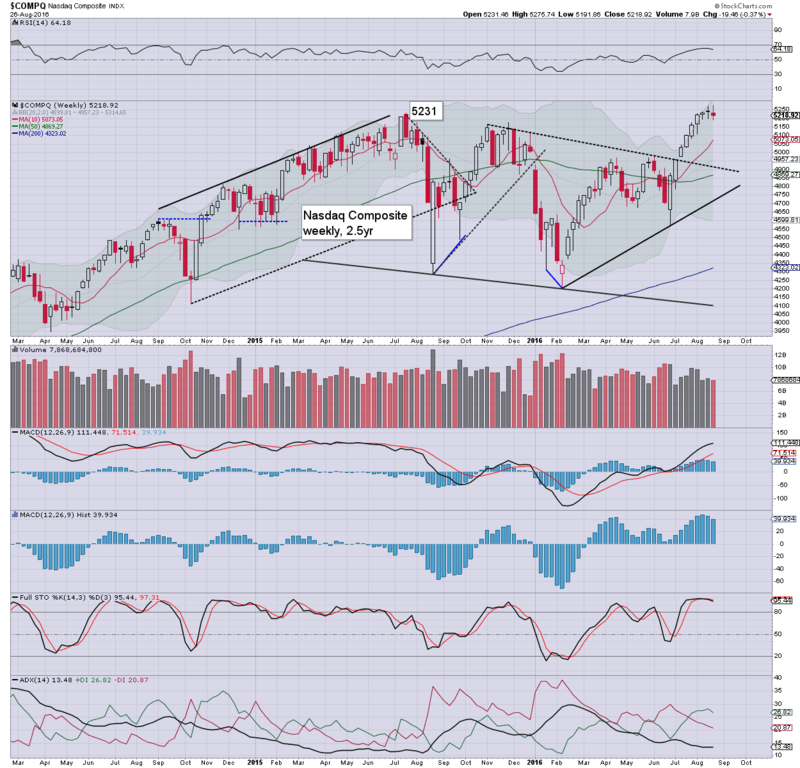 Even if the main market can remain broadly intact across the tricky Sept-Oct trading period, it will likely take the Transports another 5-6 months to challenge the Nov'2014 high of 9310. 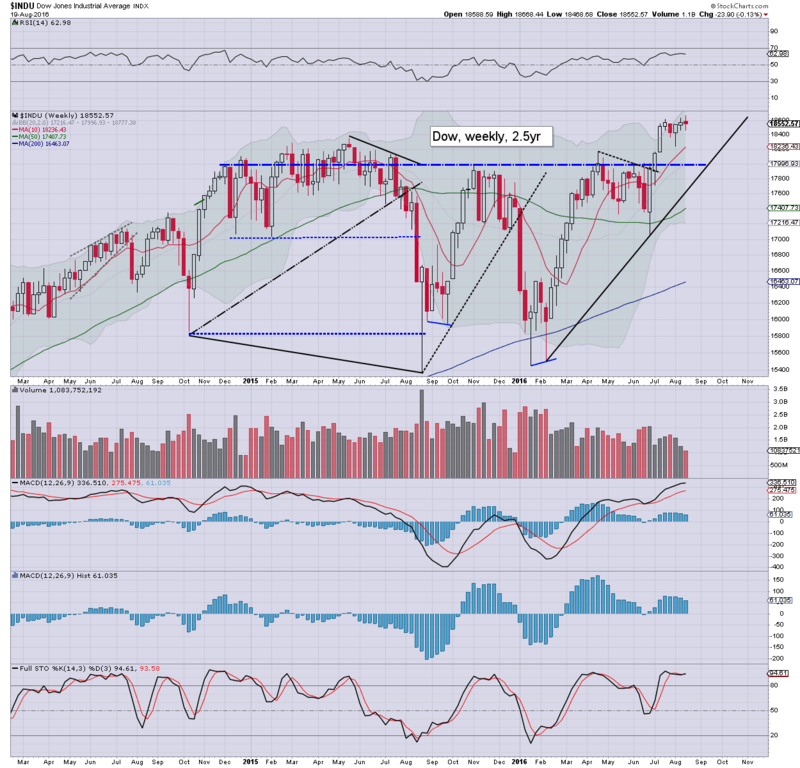 A week of choppy price action, but with notable new historic highs for the sp'500, dow, and nasdaq. The two leaders - Trans/R2K, are highly suggestive of further upside into end month...and probably into mid/late September. Unless equity bears can break back under the key breakout levels - such as sp'2134, Nasdaq 5K, Dow 18K, R2K 1200, there is little to be bearish about. F - Q2 GDP (rev'1), intl' trade, PMI serv', consumer sent. *There will be a Monetary policy symposium at Jackson Hole in Wyoming. That will span across Thurs-Friday, with Yellen set to speak Fri' 11am. 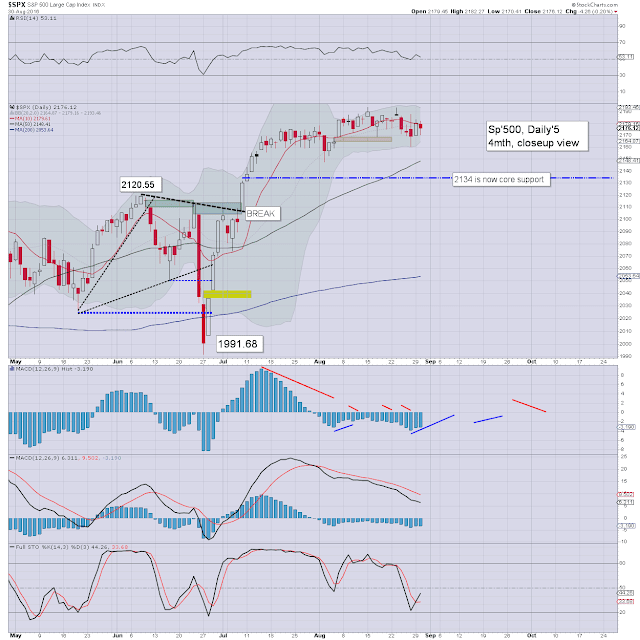 US equity indexes closed moderately mixed, sp -3pts @ 2183. The two leaders - Trans/R2K, settled +0.1% and u/c respectively. VIX settled -0.8% @ 11.34. Near term outlook offers a little chop ahead of next Friday's Jackson Hole event, but broadly, the 2200s still look due. Opening moderate weakness... but as usual... the market saw some degree of latter day recovery. 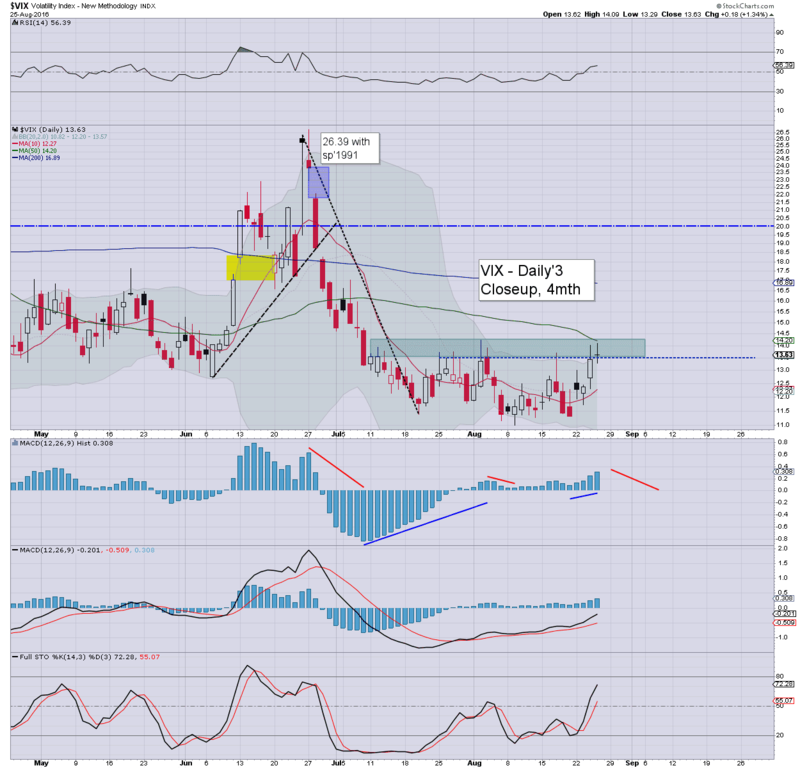 VIX remains very subdued, and it still seems probable we'll eventually see single digit VIX - for the first time since Feb' 2007. As things are, Aug' looks set to close bullish, with a sixth consecutive monthly green candle. Underlying MACD (green bar histogram) cycle is now positive, and could easily continue ticking higher all the way into spring 2017. 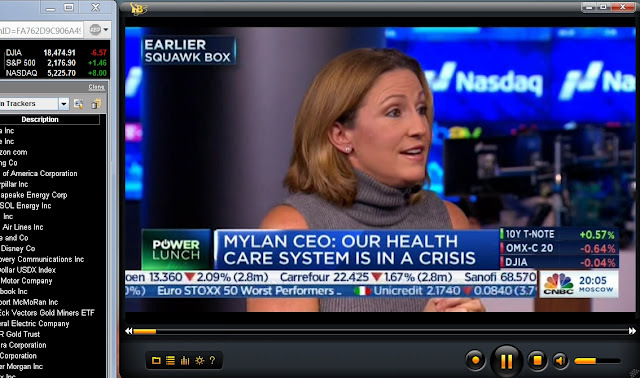 What should be clear, this market has very powerful underlying upside. There remain an increasing number of huge societal/economic problems, but hey... when hasn't that been the case on this third rock from the sun? So... moderate weakness across most US indexes. Yet... are any equity bears going to let themselves get overly excited about a decline of 12pts (0.5%) ? 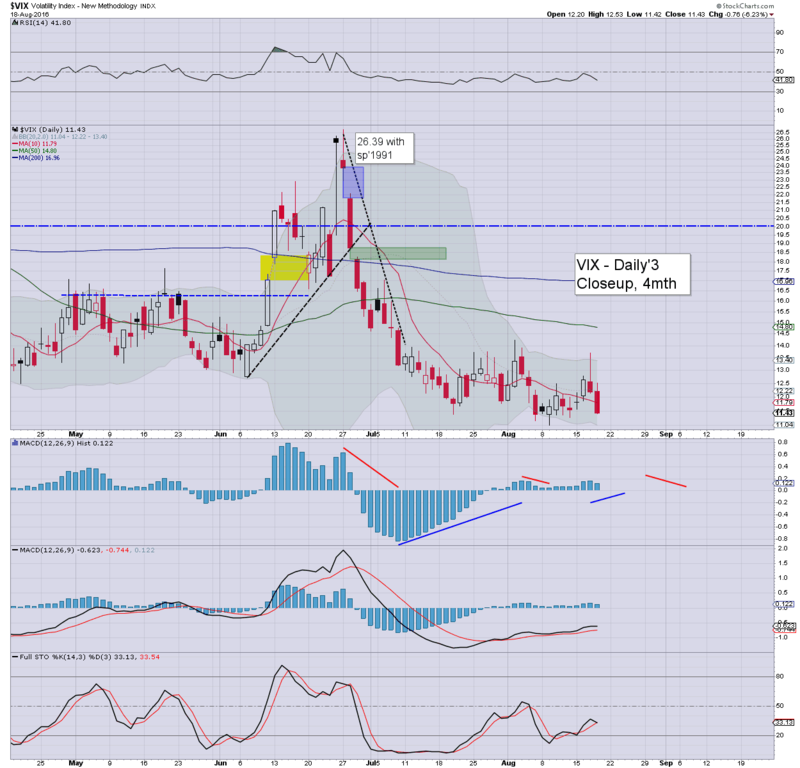 Similarly, VIX was only moderately higher... still stuck sub-teens. Does anyone seriously think the key 20 threshold is due in the near term? Broadly.. equity price action remains strong... and is certainly being helped via continued strength in Oil. A fourth consecutive net daily gain of $0.84 (1.8%), settling @ $46.58. The psy' level of $50 is well within range by mid September. The past few weeks of USD cooling is no doubt helping Oil build gains. Any closes >$50 should clarify $60 will be hit. The inv' H/S scenario - as also seen in many energy stocks, would be suggestive of $70/75 by late spring 2017. 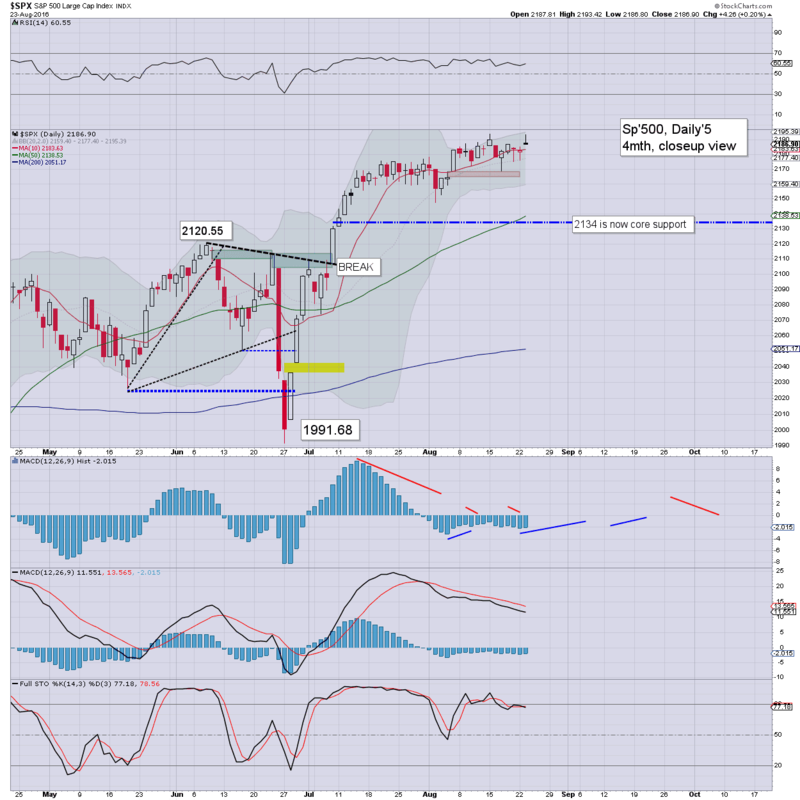 US equity indexes closed moderately higher, sp +6pts @ 2190 (intra high 2193). The two leaders - Trans/R2K, settled higher by 0.6% and 1.0% respectively. 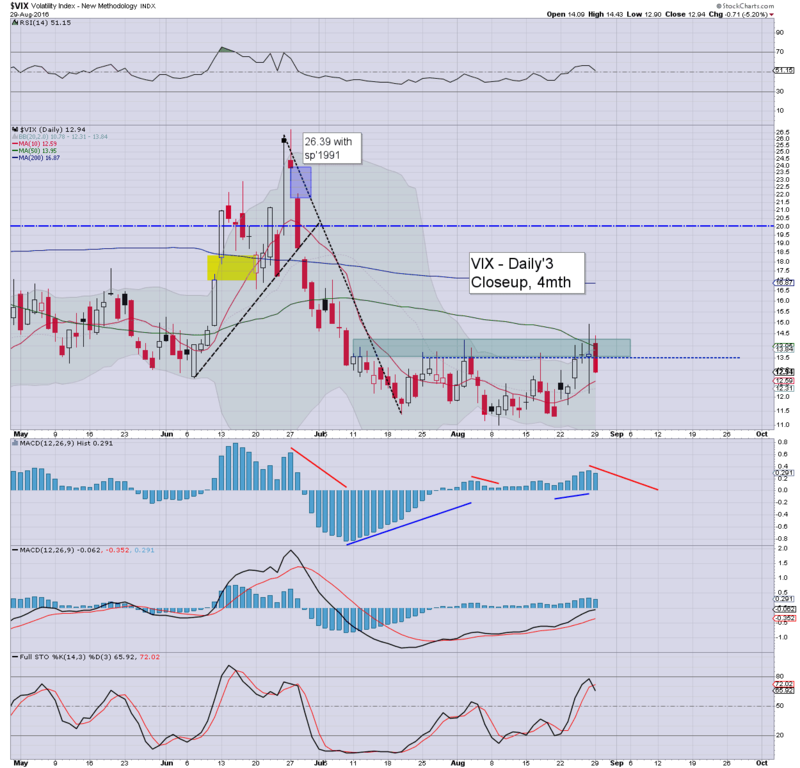 VIX settled +2.2% @ 11.81. Near term outlook remains bullish, as the 2225/50 zone looks due by mid September. 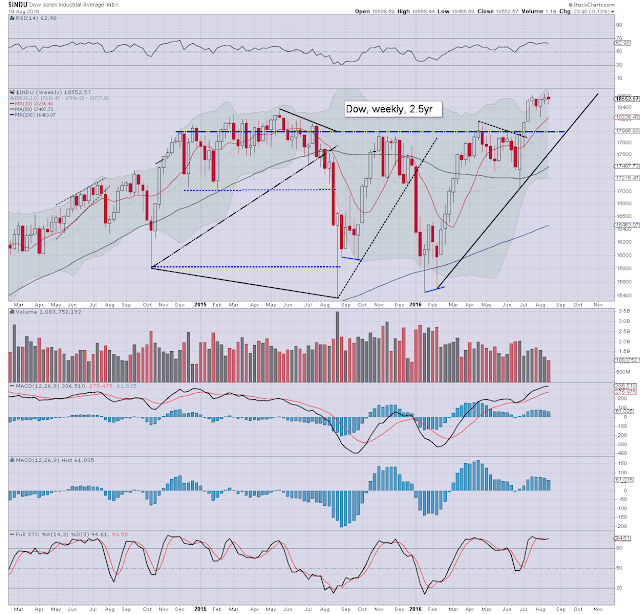 New historic highs for the sp', dow, and Nasdaq comp' to begin the week, which is about as bullish as it gets. 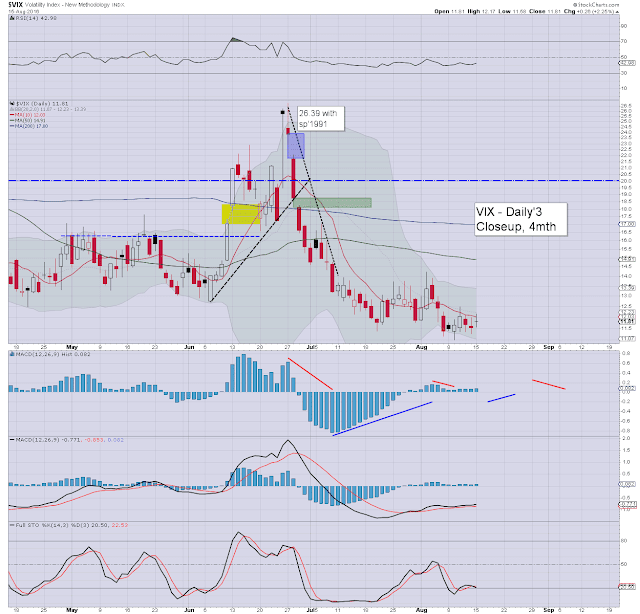 VIX remains naturally subdued, unable to even break into the low teens. Talk of single digit VIX around the Labor day holiday (Sept'5th) can begin. An eighth consecutive net daily gain of 0.4% to 6941 - the highest level since June 2015. The 7k threshold is approaching even faster than I had thought possible. Any monthly close >7K - whether August, or beyond, will be an extremely bullish sign, not just for the UK market, but across the EU... and indeed...the world.